Suicide rate among our young veterans jumped up AGAIN and by more than 10%. Few things consume a unit like a suicide. There is an immediate need for all veterans and other interested parties among our MAGA mission to consider throwing their support behind a proposal just mailed to Secretary Robert Wilkie, head of the U.S. Department of Veteran Affairs to approve a new “outside-the-box” methodology to address the suicide rate among our young veterans, which jumped up AGAIN, and by more than 10%, which was announced in late September, 2018. For the proposal see here. This proposal to Secretary Wilkie was sent on October 15, 2018, by former Marine, Steve Boyle, who is the founder and president of The Bellows Foundation, dedicated to rebuilding American education from the ground up. His proposal includes a statement to the effect that the VA’s psychology PhDs will roll their eyes at the fresh perspective reflected in the proposal, but, in fact, they should be sent to the showers because they have made no headway in reversing the increasing suicide rate of young veterans. Life-long refresher upgrades in workforce training and life-long placement and re-placement services from specific Bellows Mentors who stay in routine contact from the beginning with the young, at-risk veterans as they age. Steve has a new website, https://bellowsfoundation.wordpress.com/, (see “About Us”) which provides substantial additional information, good research, and images in support of the attachments. My brigade had two in a span of months. One particular weekend, a young soldier full of heartache and alcohol hung himself in his barracks room. He and his girlfriend were having some significant relationship issues. Two months later, another young soldier hung himself with his belt. Hours before his death, he posted a picture on social media of him in his barracks room, alone…with a bottle of liquor. Shockwaves roiled across the Brigade. Neither young man had previously displayed overt suicidal ideations. Thankfully, they came from separate battalions, but in the immediate aftermath and for days and weeks following, the units were consumed. The chain-of-command was focused entirely, as it should’ve been, as it had to be, upon the care of the family and the unit. We sent teams to funerals, executed memorial ceremonies, and supported the families in any way we could. More than that, we tore ourselves apart, seeking answers that never presented themselves. How could we have prevented this? The foregoing charts “headline” and “highlight” the problem. As suicide proliferates the active ranks, it likewise afflicts our nation’s veterans. A popular narrative claims that 22 veterans commit suicide every day which translates to roughly one every 65 minutes. 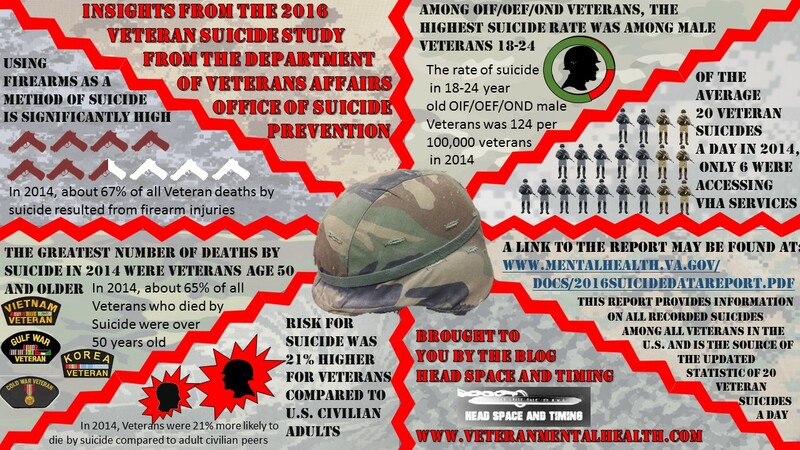 22 suicides a day—politicians regurgitate it, veterans groups made it a banner, and sympathetic citizens demand answers. Even one suicide is too many. Yet I wondered, if this is accurate, then this is an astonishing number! Peeling the onion reveals some problems. The visuals that follow may be a bit outdated but the message remains the same … one is too many and suicide among our young veterans is on the rise. Posted on October 20, 2018 December 18, 2018 Tags activist, featured, Investigative Reporting, justice, politics, swamp, Utah, Whistle Blower1 Comment on Suicide rate among our young veterans jumped up AGAIN and by more than 10%.